My Plan S2629A is a Three Bedroom, 2 & 3/4 Bath, Two Car Garage Country Home with a nice Outdoor Living Area and Covered Front Porch any growing family or retiring Baby Boomer would love to call Home. The Heart of this Home is the Family Room that is totally open to the Island Kitchen and Dining Area with their 10′ ceiling. Your Master Bedroom is a whopping 16′ x 16′ clear with awesome views looking over the rear. The Master Ensuite has an Exercise Room for your treadmill and elliptical climber workouts. Consider the option of the French Doors out to your Swimming Pool. The Master Ensuite has a Walk-in Shower. I could however rework this plan for a large Spa Tub as another option. 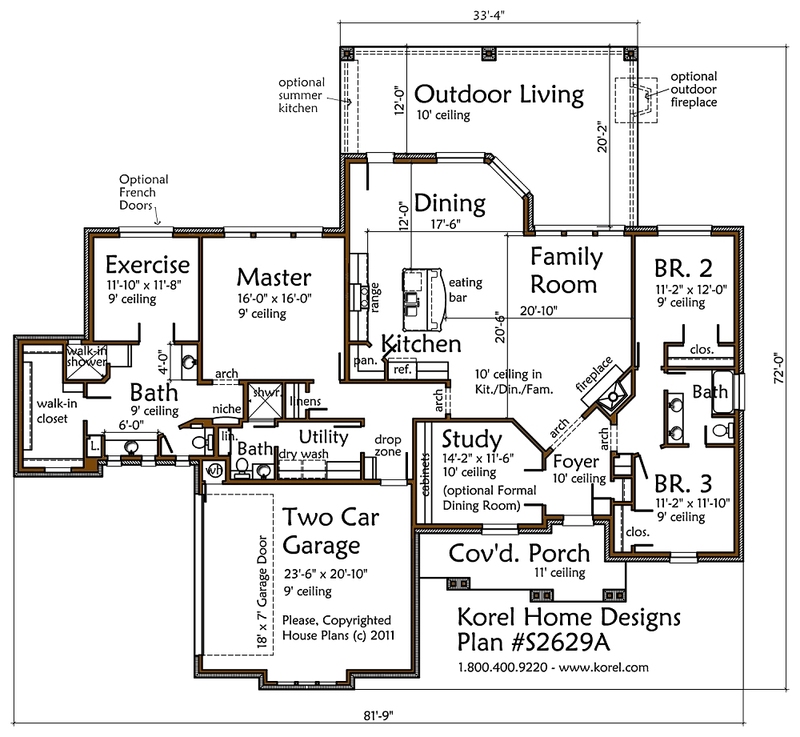 If you office from your home the Study in this plan will work out very well. If you rather, the Study could also be retrofitted as a Formal Dining Room. Through the Kitchen you pass into the Outdoor Living area where you can enjoy evenings out watching sunsets. I show where you could opt to include an Outdoor Summer Kitchen or maybe an outdoor Fireplace. Your Two Car Garage is extra deep including an 18′ extra wide Garage Door. The Garage Door is presently 7′ tall however by dropping the Garage Slab 6 we could fit the Garage with an 8′ tall Garage Door. Most of the ceilings are an affordable 9′ flat with the exception of the Outdoor Living, Kitchen, Dining, Family, Study and Foyer which ceilings are 10′ flat. The Front Porch is 11′ flat ceiling.